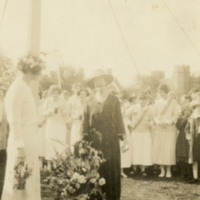 Early photo of Marion Edwards Park standing next to the maypole, behind a large vase of flowers and next to a girl wearing a crown of flowers. 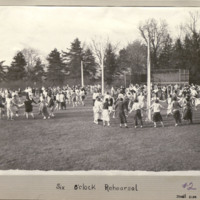 There is a small crowd gathered around them. 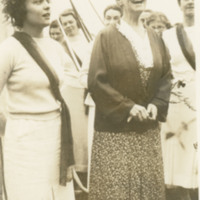 Inscribed on back: "Mrs. Henry J. Mali. 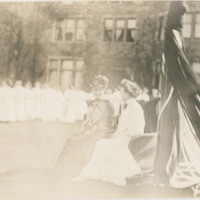 27 East 69th Street, N.Y."
Photo of M. Carey Thomas with Helen Sturgis, 1905 class President. 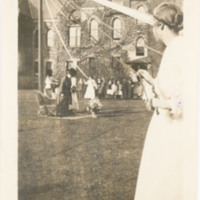 Both are seated on the lawn next to what appears to be a maypole as students in dressed in white look on. 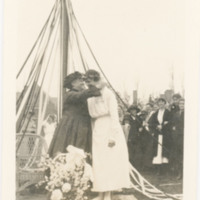 Photo of M. Carey Thomas (pictured from a distance) under the maypole at May Day of 1918. 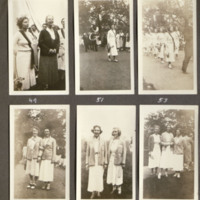 Several unidentified students are also pictured. 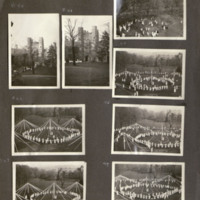 This photo is a gift of Ruth Eloise Hart (Carpenter), Class of 1918. 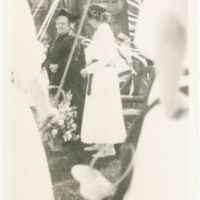 Photo of M. Carey Thomas under the maypole at May Day 1917 with an unidentified student (most likely the May Queen). 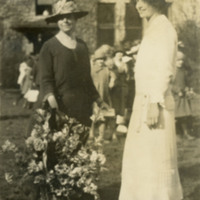 This photo is a gift of Alice Beardwood (class of 1917).